Gotta live with them. Can’t live without ‘em. Birthdays. Gotta live with them. Can’t live without ‘em. Ever wonder what actually went down on YOUR own birthday? I wonder that a lot. I know that my Mama was really, really large. She told me me that at one point she thought she was having twins. (I was number five; I could have been number five and six). I know that I was born in a little beach town. The hospital was small and a white frame building that was used for a nursing home after it was a hospital... and now it doesn’t exist. I know that at the first glimpse of me through the hospital window my (youngest) oldest sister blew me a raspberry. She also insisted that my name be the same as her doll’s; my eldest sister, lost out on her bid for my name. If only I had more details! When did labor start and how quickly did my mother get to the hospital? How fast did my Daddy drive? Did her water break? Was it an easy birth? Was she happy to meet me or just relieved it was over? Did she have any extraordinary out-of-body experiences? I remember asking her for the details once and she said she didn’t remember much about the day. I mean, why did I have to ask? Why hadn’t she been telling me all these years on the anniversaries of my birth?? I just can't understand it. I love to tell my children the stories of their births. These were by far the most important days of my life! I realize that as adults they can’t stand it, but at least they know every little detail... no matter how stupid it may seem. Every birthday gives me a reason to recall the story. And the right. As a mother, you don’t have many rights but in my book this is one of them. And PICTURES? What about those? There are none of me. I know back in the 50’s cameras were NOT like opinions (you know... everybody’s got one). I realize that it was quite expensive to own a camera and purchase and process film. But not even one picture of the new tiny blessing? Today a film crew is called in for every aspect of a birth. Even before the birth and at the “revelation” of the gender of the child! Aren’t today’s newborns so fortunate? Babies are documented (daily) on Facebook, by e-mail and have their own pages or addresses before birth! It is SO amazing to see what technology can be used for. In this case it is building the child’s self esteem and confidence. Which leads me back to the original question... I just wonder what went down on my actual birthday. Hey, maybe that’s what’s wrong with me, my self-esteem and confidence. If you know your story, let me hear it. I love a good story. Siblings Day was this past week. Well, shoot a monkee! I totally missed it! So maybe it is still appropriate to talk about my siblings? A book has been written about Birth Order (The Birth Order Book by Kevin Lehman), places in the family and the general characteristics of those in Birth Order. It is the opinion of some that every family is different and based on the number of years placed between children, it is said another “family” can be constituted. Pshaw! In my humble opinion... siblings are siblings are siblings. I can say that because I am the Baby of the Family. Everyone knows that they are different. Everyone has an idea of what it is like to be the Baby of the Family. You really don’t know what it like unless you are the Baby of the Family. Older siblings have an idea of what your life was like when you (the Baby) became the only child at home. Your life was the charmed one. You were the favored one. They believe you were spoiled during that time. They believe you got to do things they were not allowed to do. They refuse to believe that your life was just like theirs. Just in a different decade. When you have the same parents, those parents change very little during the course of a generation. They become more “mellow”. (I can say this from personal experience, having become an older parent.) That is the only difference I see. Over time, parents learn to pick their battles and they learn what is important. I SOOOO love my older siblings. But they still see me as a child. I suppose to them I will always be that younger child... nothing will change that. My oldest sister was more like a mother to me. She was 14 when I was born and always displayed love and affection for me when the other siblings teased me until I actually cried. My second oldest sister expected me to babysit her children because she had been forced to babysit me as a teen. What? That is not my fault... blame Mama... sorry girl, but I've got a date and I won't be here this evening! Actually it is 3 and a half years. 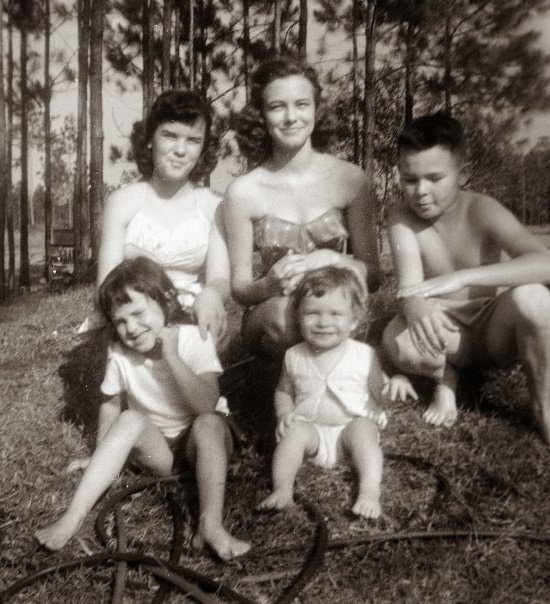 My siblings with me, the baby, sometime in the late 1950s. We are in an area of western California known as Big Sur. When we checked into our lodge three days ago it was raining. We had no idea at the time that rain would be all we would see for the next three days. We had hoped to commune with nature and have some outdoorsy adventures... like hiking. I had envisioned arising at daylight, having a hearty breakfast and taking off until sunset. My first two visions have sort of happened; the latter has only been a vision so far. The rain has kept us off the trails of this beautiful state park. Rain had been predicted until late Thursday so I had resolved to myself I would enjoy the few bursts of sunlight we were able to obtain. I had even mentioned to the Hubs, “At least everything is so green!” I am really glad those forecasts are not always right. Today was the day we had decided to do the Point Sur Light Station tour. (If you know me, you know I hardly can pass up a good lighthouse -- ANYWHERE.) We had seen the Light Station on a big rock just south of Carmel on Highway 1. We checked out the schedules and days of the tours and picked today as the best day for us to do it. All through the night last night it rained. Peaceful, wonderful, sleeping rain! When we awoke this morning to the same wonderful rain, I figured that Our Light Station Tour was probably going to be cancelled. We arose (before) dawn. While having a hearty breakfast, Hubs prayed we would have “good weather.” I agreed with him, in prayer. Yes, wouldn’t that be nice, Lord? We then casually headed north about 10 miles to the tour meeting point: mile marker 54.1. Though we’d arrived early, there were already three cars waiting at the gate! And as we waited for the tour to start, the sun began to shine. It did shine. And there it was... shining some more! This particular tour was a walking tour... about 1 mile straight up the rock and 1 mile back down the rock. And what a fabulous tour it was! The sky was the bluest I have ever seen a sky. The wind was barely blowing. Hubs and I agreed after the tour that it was like none other we’d ever done. After the tour, we hit the slippery trail for about a mile or so to a very TALL waterfall and hugged a few very LARGE trees. More good news for us: the weather forecast looks sunny for the rest of our time here! My vision was dream-come-true, like most of my life these days. The Big Rock with a Lighthouse.